S and I got married in New York in April 2006. S flew back to London a few days before I did, so I had some time to explore Manhattan on my own. 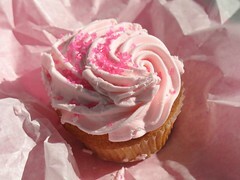 I wish I could remember the name of the bakery where I bought this cupcake. From the address and description, I think it might have been Buttercup Bake Shop. What I do remember is that it tasted as good as it looks!